So hey! Welcome back to the brand new me. New? Me? How's that? Oh wait I'll tell you how..
To R, yes yes. After 8 beautiful years, we finally decided to take the step. Look! Marriage changes you. Believe me it really does. I've shifted to another city, with R, in our home. It's something we always spoke about, but now that it has happened, you can't believe it has. I've gone on a short sabbatical, enjoying domesticity for a few days before I jump into the workforce once again. It's been a mega hectic last few months, what with preparations for the wedding, and preparations of me leaving town. Learning new things. Shopping till my shoulders break off. Skin treatments. Some more shopping. Packing. Oh god the packing. The wedding itself. Rituals pre and post that. The amazing fun honeymoon to Spain. Coming back to Delhi and then shifting to Mumbai, bidding farewell to what was home for the last 12 years. Turning R's bachelor pad to a home here. So I'm more than entitled to a bit of a break. And what else would I do in a break, than cook and experiment? Oh but there's a catch. You see, when Mum used to cook regular dal rice fish vegetables at home, I was free to do cakes and cookies and what not. Now that I'm on my own, the responsibilities of a household is on me. So yes, I now make regular home food. With my twist and experimentation. Dal. Different kinds of rice. Chicken. Fish. A myriad varieties of sabzis. And the cakes and sweets of course, just lesser. So here goes: this blog will now also feature food to feed people in real life. Daily stuff that you make quickly, for you know I hate slow food. Stuff that you can whip up for lunch. Simple easy home style food. The cakes etc will always be there. But as of right now, Aishwarya Eats has grown up. So the first thing I thought I can share with you is a dal. It's healthy, quick and one-pot. Using stuff you ALWAYS have in your kitchen. I make this almost daily! 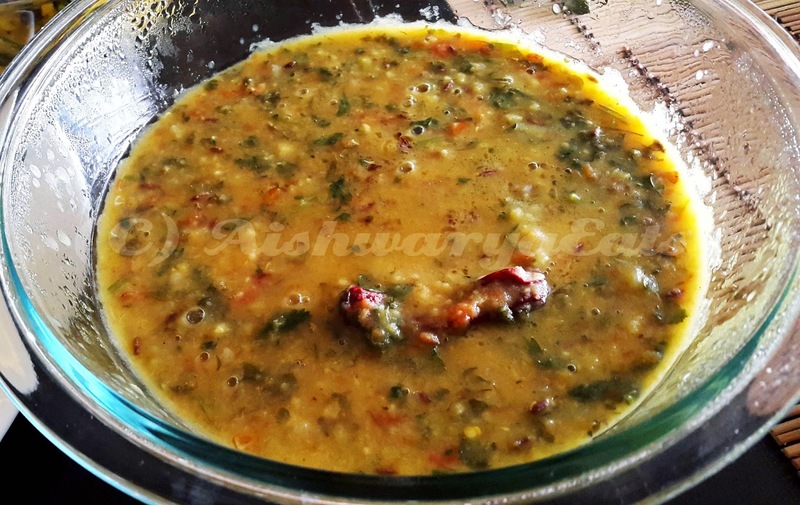 Presenting the Yellow Dal Fry, homey and comforting. 5-6 cloves of garlic, chopped. You can adjust the amount of garlic according to your liking. In a pressure cooker, add the thoroughly washed pulses. Fill with enough water, the level should be about half an inch (more or less) above the level of pulses. 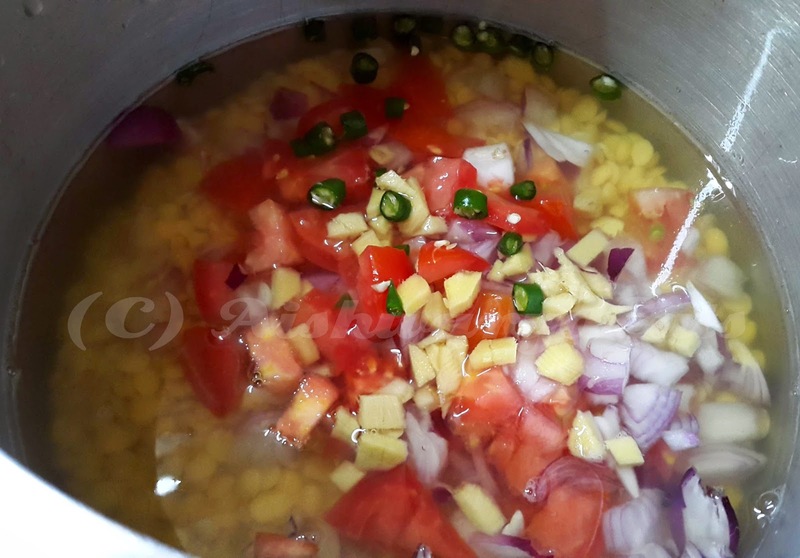 Add in the ginger, garlic, onion, tomato, green chilli, hing, and salt. Don't worry about the salt now, you can adjust it later. Keep it on the low side though. Pressure cook this till about 8-9 whistles. Please be careful with the cooker! Make sure the release vent has nothing stuck in it. Let all the pressure go out. Once you open it (open it only when all the steam is gone), stir it with a whisk or wooden spoon to mash all the pulses. At this point, add water if need be to liquify the dal in case its too thick. In case it's too thin, turn the heat back on high but don't put the lid back. Let it boil for some time, the appropriate thickness will come. Adjust the salt once your thickness is achieved. Now for the tempering. Keep every single ingredient ready. In a tadka pan or a small pan, heat the ghee. When the ghee is hot, add the jeera. When it starts to splutter, add the whole red chilli, broken into two halves. Next, fry the garlic in the ghee, I like it a bit brown and crispy. Once it's fried, add the hing. Turn the gas off. Add the red chilli powder, stir and add the kasuri methi. Immediately add this into the dal in the cooker. It should splutter wildly! In case you think the ghee has cooled, heat it back up and then add it. Dump in the coriander. Mix. Immediately turn out into the serving bowl. Cover till you're ready to eat it. Preferably, before eating, add a little bit more coriander, and a squeeze of lemon if you want. Serve with rice, roti, phulkas, parathas, anything! And that's it. I'm telling you. If I, the one who only knew cakes and pannacottas, can make this, anyone can! This was the same! And it's so super quick, can't believe a day would come when it would become my go-to daal!